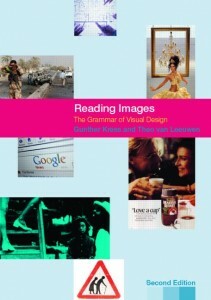 Gunther Kress and Theo van Leeuwen argue for the centrality of visual images in the grammar of communication, which in many social contexts tends to favor ‘verbal’ expression. In the early years of schooling, children are constantly encouraged to produce images, and to illustrate their written work. Teachers comment on these illustrations as much as they do on the written part of the text, though perhaps not quite in the same vein: unlike writing, illustrations are not ‘corrected’ or subjected to detailed criticism (‘this needs more work’, ‘not clear’, ‘poor expression’, and so on). They are seen as self-expression, rather than as communication: as something which the children can do already, spontaneously, rather than as something they have to be taught. By the time children are beyond their first two years of secondary schooling, illustrations have largely disappeared – from the children’s own texts as well as from the texts produced for them. Whereas texts produced for the early years of schooling are richly illustrated, later on visual images give way to a greater and greater proportion of verbal, written text. In as much as visual images continue, they have become maps, diagrams or representations with a technical function – photographs illustrating a particular landform or estuary or settlement type, in a geography textbook, for instance. Outside school, however, images continue to play a very important role, and not just in texts for children. Newspapers, magazines, public relations materials, advertisements and many kinds of books today involve a complex interplay of written text, images and other graphic elements, and what is more, these elements combine together into visual designs, by means of layout. The skill of producing texts of this kind, however important their role in contemporary society, is not taught in schools. In terms of this new visual literacy, education produces illiterates. Writing itself is of course also a form of visual communication. Indeed, and paradoxically, the sign of the fully literate social person is the ability to treat writing completely as a visual medium – for instance, not moving one’s lips and not vocalizing when one is reading, not even ‘subvocalizing’ (a silent ‘speaking aloud in the head’, to bring out the full paradox of this activity). Readers who move their lips when reading, who subvocalize, are regarded as still tainted with the culturally less advanced mode of spoken language. This kind of visual literacy (the ‘old’ visual literacy) has, for centuries now, been one of the most essential achievements and values of Western culture, and one of the most essential goals of education, so much so that one major and heavily value-laden distinction made by Western cultures has been that between literate (advanced) and non-literate (oral and primitive) cultures. No wonder that the move towards a new literacy, based on images and visual design, can come to be seen as a threat, a sign of the decline of culture, and hence a particularly potent symbol and rallying point for conservative and even reactionary social groupings. The fading out of illustrations in texts by and for children, then, is not a straightforward disvaluation of visual communication, but a valuation which gives particular prominence to one kind of visual communication, writing, and to one kind of visual literacy, the ‘old’ visual literacy. Other visual communication is either treated as the domain of a very small elite of specialists, or disvalued as a possible form of expression for articulate, reasoned communication, seen as a ‘childish’ stage one grows out of. This is not a valuation of language as such over visual communication. Even now the structures, meanings and varieties of spoken language are largely misunderstood, and certainly not highly valued in the education system (with some exceptions, such as in formal ‘debating’) or in public forums of power. To sum up: the opposition to the emergence of a new visual literacy is not based on an opposition to the visual media as such, but on an opposition to the visual media in situations where they form an alternative to writing and can therefore be seen as a potential threat to the present dominance of verbal literacy among elite groups.